Oops - we don't appear to have a video for the ScanJet 7000. Get high productivity duplex scanning plus HP Precision Feed technologies including ultrasonic double feed detection, mixed-stack handling and intelligent picking. Integrate into existing document management systems or use as a standalone solution. 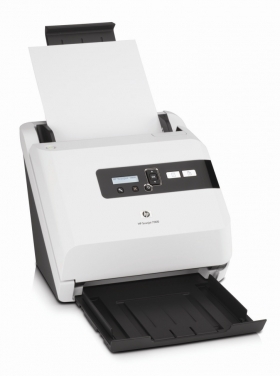 Get high productivity document scanning with speeds of up to 40 ppm/80 ipm1. Streamline workflows with this high productivity document capture device. Scan at up to 40 ppm/80 ipm1 and select scan profiles via the two-line LCD control panel. Monitor and manage usage using HP Web Jetadmin. 2,000-page daily duty cycle. Maximise efficiency with HP Precision Feed technologies and document capture enhancement tools. Get superior paper handling with HP Precision Feed technologies including advanced separation and picking processes and ultrasonic double-feed detection. Process ID cards, receipts, A4 papers and more in a single batch. Kofax VRS® included. Integrate seamlessly with most applications including existing document management systems. Experience seamless integration with software applications including document management systems – ISIS®, TWAIN and WIA drivers included, certified for many 3rd party vendor solutions. Scan to SharePoint, web folders, Microsoft Word or email.